This is one of my favorite Holiday Hairstyles. It can be formal or casual and it holds all day long. 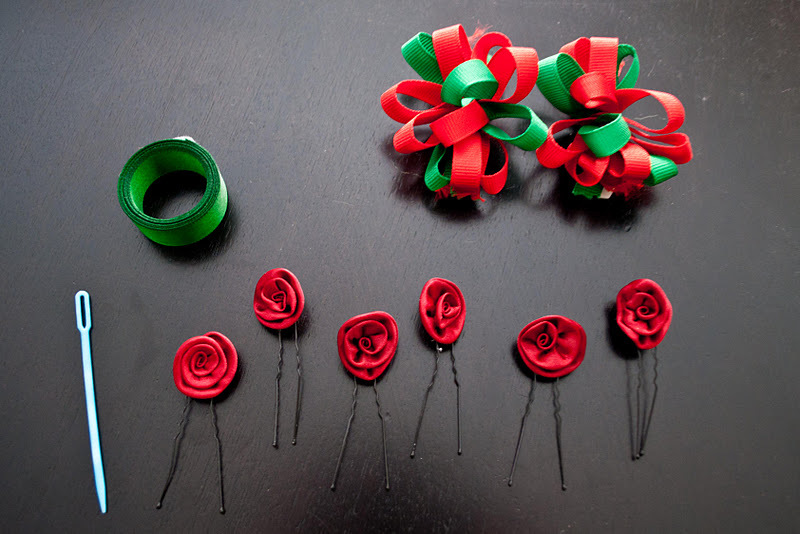 These are the supplies you will need: Green ribbon, a plastic yarn needle, flower hair pins, and a Christmas hair clip or two. The basic hairstyle beneath this wreath is the Angel Halo and I have a instructional video for that here. The only difference is that instead of ending it by the ear with a bun, I continued twisting the extra hair around the top of the head and pinned it underneath the original French twist on the side that I started. That way I had a full circle to work with. 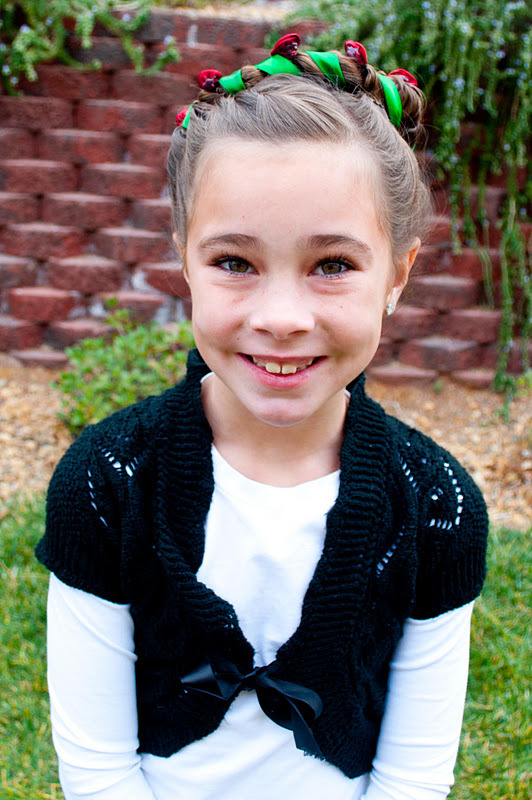 Thread your yarn needle with the green ribbon and insert it through your Angel Halo down at the bottom by the neck. Begin wrapping the ribbon around your twists and follow your entire circle until you end up back at the bottom. 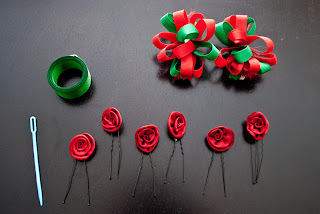 Tie your two ends of ribbon together to secure them and then cut off any excess. 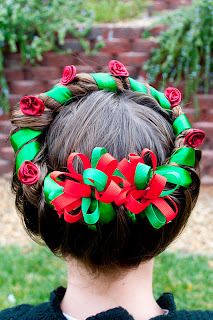 Now grab your Christmas hair clip and place it right over the ribbon ends. We have used two here because we didn't have one that was quite big enough. 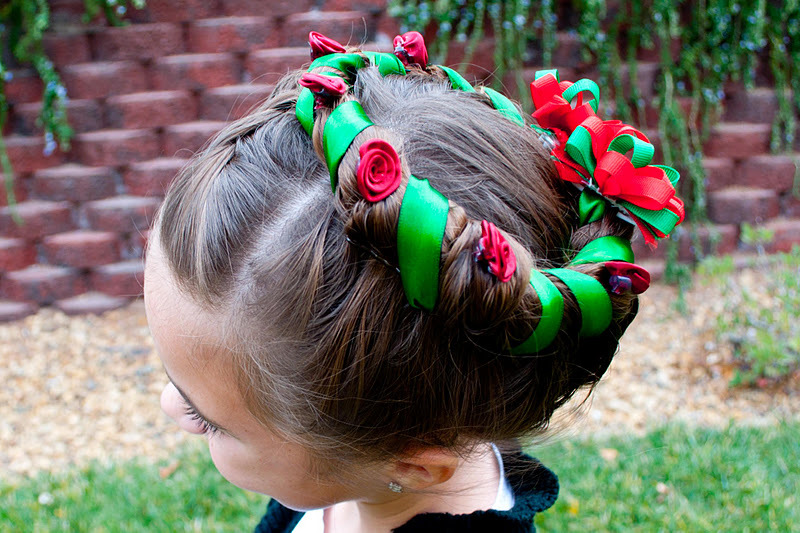 Now take your flower hair pins and insert them around the wreath wherever you think it looks good. 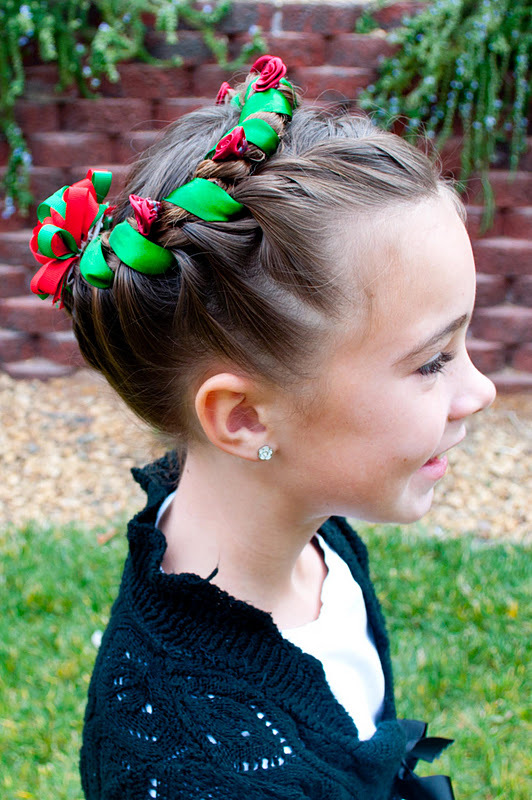 It makes a really festive updo for your princess this season! I absolutely love your blog, although I do not have a girl child, nor do I yet have female grandchildren, but I had to pop in to say how much I do like what you do! The accessories are adorable - in fact, I bought some hair pins and am going to decorate some and send to my nieces out of state. Thanks for the sweet comment Carol and we are happy to have you as a reader! You are a hair genius. You have helped me tremendously styling my daughters' hair. I check your blog almost daily now and it's my go to site. Thank you so much! how do you do the angel halo?